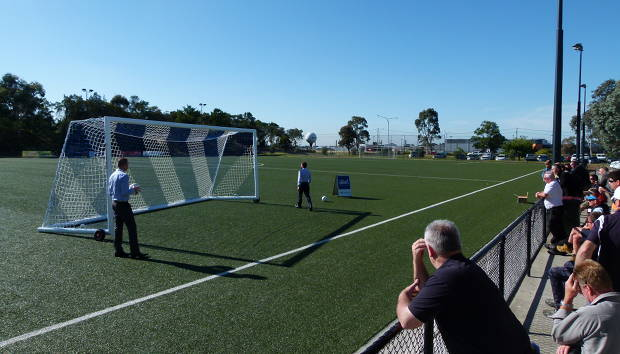 STA Victoria recently held their ‘Summer of Soccer’ Seminar at the Kingston Soccer Club in Cheltenham. The event, sponsored by Abel Sports, was a fantastic opportunity for the Victorian turf industry to come together one last time in 2014, catch up and chat all things soccer pitches in the lead up to the AFC Asian Cup that will commence in the next few months. After a hot breakfast and welcome from STA VIC President, Nathan Tovey, the formal proceedings kicked off with a talk from Matthew Young from the City of Kingston. He spoke about the facilities that the City of Kingston manage, inclusive of the 57 sports grounds and 8.7 hectares of irrigated sports fields. He also touched on the recent soccer complex upgrade they have undertaken including a new storm water harvesting system, complete with UV filtration. After Matthew’s talk, everyone headed outside with Abel Sports Peter Mercer, to see their goal posts in the flesh and find out all about their specifications and benefits. From there, it was back inside to listen from Tim Frampton from Football Federation Victoria to get an overview of the growth of soccer in Victoria, which now boasts 332 soccer clubs and more than 56,000 players. There are currently 543 pitches (including 41 synthetic pitches) being managed by turf professionals in Victoria. A quick morning tea and a chance for everyone to grab a coffee and relax and then we were back for the second session of the day, which kicked off with Dr Marke Jennings-Temple from STRI. He talked about everything it takes to produce a world-class soccer pitch including the changes in stadium designs over the years. He also touched on the idea that synthetic turf is fast becoming a reality. Next up was the chairman of the infamous Bentleigh Greens Soccer Club, Ray Georgiou. He touched on the Greens recent brush with Perth Glory and what it took to get there. Ultimately, he says that the club has a lot of faith and hope for the future and they are lucky to have so many semi-professional players. To round out the seminar, Justin Lang from AAMI Park and Troy Jordon, formerly of the revolutionary Forsyth Barr Stadium, took to the lectern and took us through their respective experiences working in Brazil at the World Cup. They spoke about the trials and tribulations of working through language barriers, different greenkeeping techniques and the inevitable stresses of overseas travel. The morning was a fantastic chance to for the turf industry to come together to celebrate soccer in Victoria and swap questions, knowledge and hear from the experts.